Something you lost… My mind! Sunday I was reading for my Writing About the Profession class. Hubby took the girls and left the house so that it would be quite for me to read/write/do homework. Earl sent out an invite to Sunday Night dinner saying the theme was spaghetti. Well I wasn’t sure hubby would be home in time for that so I told her we’d try to make it if he ever got home. Usually SND starts around 5pm. at 4:30 hubby calls and says he’s on his way home. I asked about Sunday night dinner and he said of course we’d go. Great nothing was made and I couldn’t think of anything really to take that I had the ingredients for, except Buttermilk Brownies. So I quickly looked through the recipe to make sure I had time to bake them (couldn’t remember the bake time) and if I hurried we’d be a few minutes late but they just live around the corner so all should be good, right? So I threw the ingredients together, got them in the oven and started hoping for the best. 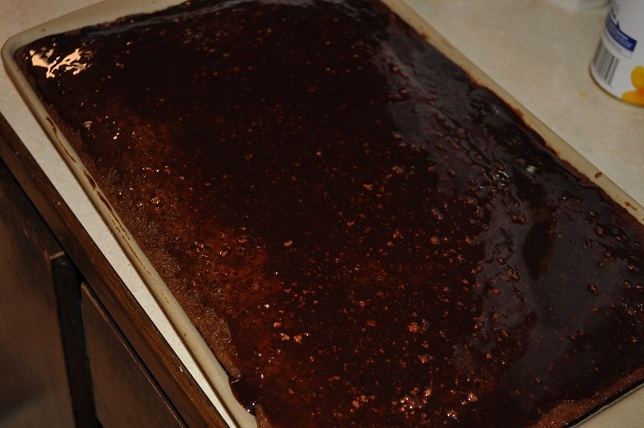 About 8 minutes in to the 15-20 minute baking time, hubby came in the house and said something to me and I saw the sugar sitting on the counter. Immediately I had a DOH moment and realized I DIDN’T PUT THE SUGAR IN THE BROWNIES. Holy crap how in the heck did I forget to do that? Leave it to me… Needless to say I took them anyway, they weren’t bad, just weird texturally and we added ice cream to the top and YUM! :). Ice cream makes everything better! Wish me luck, I've lost my mind!